Nike reported third-quarter earnings and sales that beat analysts’ forecasts. “As we close Q3, we now see a significant reversal of trend in North America … ,” said Mark Parker, Nike’s CEO. Demand for the company’s sneakers in North America has waned. Gross margins fell for a ninth straight quarter, indicating Nike continued to compete with rivals on price. Nike on Thursday reported third-quarter earnings that beat analysts’ forecasts for earnings and revenue. The footwear maker reported $US0.68 in adjusted earnings per share excluding charges related to the Tax Cuts and Jobs Act, and $US8.98 billion in revenue. Analysts had forecast earnings of $US0.53 a share on revenue of $US8.85 billion, according to Bloomberg. 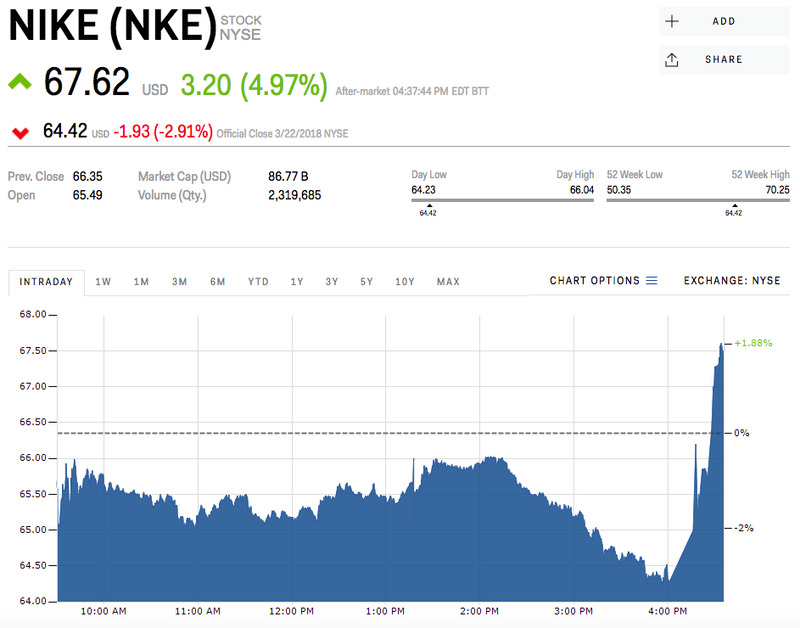 Nike shares gained as much as 5% in after-hours trading. The company’s performance was supported by revenue growth in Asia and Latin America. However, footwear sales in North America remained weak, while apparel sales growth in the region was flat year-over-year. “As we close Q3, we now see a significant reversal of trend in North America … ,” Mark Parker, Nike’s CEO, said in the earnings report. Gross margins – what’s left of revenues after the cost of products sold is – fell for a ninth straight quarter, indicating that Nike continued to compete with rivals on price. Earlier on Thursday, The Wall Street Journal reported that Pershing Square CEO Bill Ackman had exited the stake he acquired in the fourth quarter after earning about $US100 million. Nike’s earnings were released days after the company announced an executive shakeup. Trevor Edwards, the president of Nike Brand, resigned over “workplace behaviour” complaints. 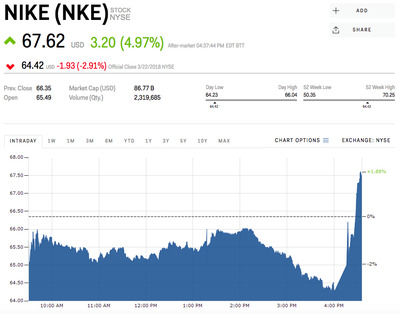 Nike’s stock gained about 22% in the year through the market close on Thursday.